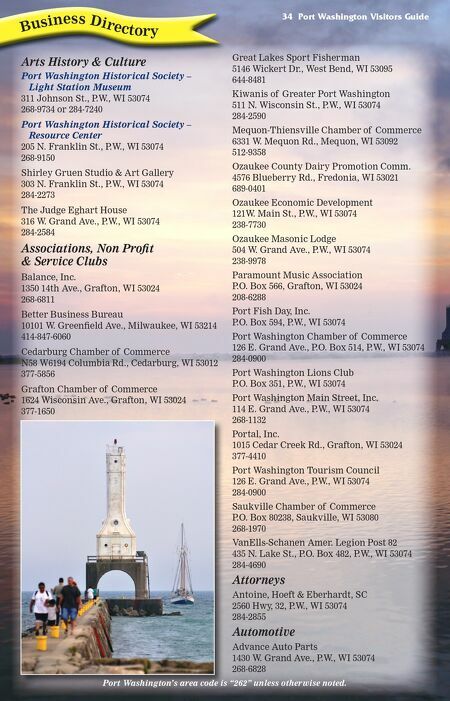 34 Port Washington Visitors Guide Bu si n ess D ir ec t o ry Arts History & Culture Port Washington Historical Society – Light Station Museum 311 Johnson St., P.W., WI 53074 268-9734 or 284-7240 Port Washington Historical Society – Resource Center 205 N. Franklin St., P.W., WI 53074 268-9150 Shirley Gruen Studio & Art Gallery 303 N. Franklin St., P.W., WI 53074 284-2273 The Judge Eghart House 316 W. Grand Ave., P.W., WI 53074 284-2584 Associations, Non Profit & Service Clubs Balance, Inc. 1350 14th Ave., Grafton, WI 53024 268-6811 Better Business Bureau 10101 W. Greenfield Ave., Milwaukee, WI 53214 414-847-6060 Cedarburg Chamber of Commerce N58 W6194 Columbia Rd., Cedarburg, WI 53012 377-5856 Grafton Chamber of Commerce 1624 Wisconsin Ave., Grafton, WI 53024 377-1650 Great Lakes Sport Fisherman 5146 Wickert Dr., West Bend, WI 53095 644-8481 Kiwanis of Greater Port Washington 511 N. Wisconsin St., P.W., WI 53074 284-2590 Mequon-Thiensville Chamber of Commerce 6331 W. Mequon Rd., Mequon, WI 53092 512-9358 Ozaukee County Dairy Promotion Comm. 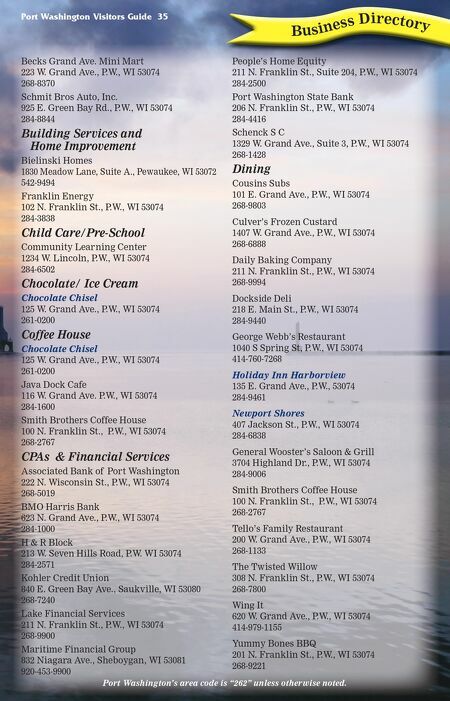 4576 Blueberry Rd., Fredonia, WI 53021 689-0401 Ozaukee Economic Development 121W. Main St., P.W., WI 53074 238-7730 Ozaukee Masonic Lodge 504 W. Grand Ave., P.W., WI 53074 238-9978 Paramount Music Association P.O. Box 566, Grafton, WI 53024 208-6288 Port Fish Day, Inc. P.O. Box 594, P.W., WI 53074 Port Washington Chamber of Commerce 126 E. Grand Ave., P.O. Box 514, P.W., WI 53074 284-0900 Port Washington Lions Club P.O. Box 351, P.W., WI 53074 Port Washington Main Street, Inc. 114 E. Grand Ave., P.W., WI 53074 268-1132 Portal, Inc. 1015 Cedar Creek Rd., Grafton, WI 53024 377-4410 Port Washington Tourism Council 126 E. Grand Ave., P.W., WI 53074 284-0900 Saukville Chamber of Commerce P.O. Box 80238, Saukville, WI 53080 268-1970 VanElls-Schanen Amer. Legion Post 82 435 N. Lake St., P.O. Box 482, P.W., WI 53074 284-4690 Attorneys Antoine, Hoeft & Eberhardt, SC 2560 Hwy, 32, P.W., WI 53074 284-2855 Automotive Advance Auto Parts 1430 W. Grand Ave., P.W., WI 53074 268-6828 Port Washington's area code is "262" unless otherwise noted.